Back in Star Time, I planted a few seeds that meant little or nothing to that story, but provided the framework for this one. In one, the Australian scientist that was interested in genetic engineering, after a hundred years, has resulted in Australia’s dominant industry. Genetic engineering has so much potential, both for disaster and for cool concepts, and I dipped into both. The real-life GM enhanced crops we read about in the news are just a hint as what is possible. Where will we be in a hundred years, and what kinds of disasters should we look out for before they have a chance to happen? But if I had more time, I would have written two books about this era, instead of the one, flying the world in a green blimp. Another stage in the saga is the political evolution. With a world-wide disaster, I imagine there would be dozens, perhaps hundreds of monarchies, none of which would be terribly interested in evolving into more populist forms. We’ll just have to see how that develops in these books, won’t we? Another seed left from Star Time, and developed in Kingdom of the Hill Country is the changing destiny of our first immortal character. If you’ve been reading along, then you’d know the Gnomes true identity, even if none of the book’s characters do. We’ll be seeing more of this in future books. If you have no idea what I’m writing about, sorry. I do have to protect some spoilers, you understand. There’s another concept that I’ll be using that shows up in this book. A world-wide catastrophe leaves scars in humanity’s view of the world. After radiation flares that left damage to the atmosphere, no one lives in the mountains anymore, even after that damage has healed. Well, that’s enough background. The story is about the characters, after all. This story takes place in a time where technology has recovered to current standards, although obviously many things developed differently. Still, with a guy with a smartphone hoping for a future making videos and a rich girl using her influence to make a name for herself in the entertainment industry, the story sounds contemporary. Parts of their story were very hard to write. Much of it takes place in the (current) Midland Commemorative Air Force hangars, where so much aircraft history lives. It’s a fitting place for one last seed from Star Time to blossom. No one remembers the aliens, but in the first chapters of the first book, there’s a hint that one last engine was lost, and where it stayed for decades. 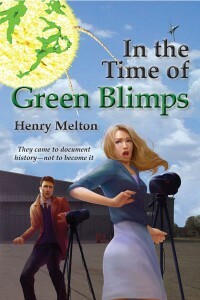 So, with a storyline that still brings emotional twinges and with the beginning of humanity’s next space age, In the Time of Green Blimps is my favorite.